It's one outdoor activity that isn't affected by the typical Irish summer - lashings and lashings of lovely rain punctured briefly by sunny spells where we routinely complain about it being too hot - so it's good news that surf lessons in Ireland are cheaper than anywhere else in Europe. 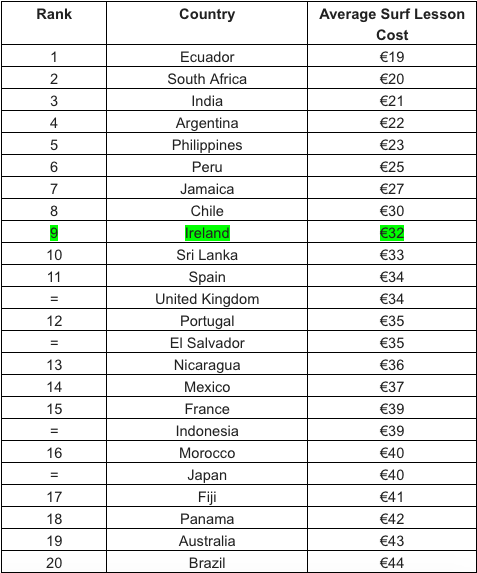 Ireland ranks 9th globally when it comes to learning how to surf, with lessons costing an average of just €32 each. “Ireland is one of the best places to learn how to surf and it’s great to see it is also one of the least expensive," said Nicky Kelly of SurfHolidays.com, who compiled the Surf Lesson Price Index. "There are beaches in Donegal, Mayo, Sligo, Clare, Cork, Kerry & Waterford that are great to learn on. People are choosing to surf in Ireland, and it is catching up on the more obvious surf destinations such as Portugal and France." Surfing has become massively popular over the last decade in particular, with Kelly's site booking over 11,000 lessons in 2016 alone. The Surf Lesson Price Index analysed the average cost of a beginner’s surf lesson across 850 surf schools around the world. To determine Ireland’s average surf lesson cost, Surfholidays.com studied 42 Irish surf schools regulated by the Irish Surfing Federation. The majority of Ireland’s surf beaches can be found along the Wild Atlantic Way. Ecuador has the lowest priced surf lesson in the World at €19 with Norway the most expensive at €112 per lesson.